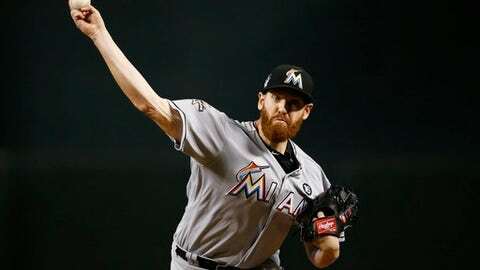 JUPITER, Fla. (AP) While Giancarlo Stanton and Christian Yelich were happy to be traded by the Miami Marlins, right-hander Dan Straily says he wants to be a cornerstone of the team’s rebuilding plan. Straily’s reaction to the Marlins’ offseason dismantling under new CEO Derek Jeter differs dramatically that of from fans angered by the moves and players wanting out because they anticipate lots of losing. Half of the everyday lineup was traded, including Yelich and National League most valuable player Stanton, and Miami received mostly prospects in return. But Straily said a reboot was justified after eight consecutive losing seasons under former owner Jeffrey Loria. The Marlins went 77-85 last year, and after the season, Stanton voiced his frustration with a pitching staff that had the fifth-worst ERA in the majors. There was speculation Straily would be among those traded this offseason, and he’s glad he wasn’t. The roster purge didn’t bother the well-traveled 29-year-old veteran because he has been part of makeovers before. Straily pitched briefly for the Chicago Cubs and 2014 and the Houston Astros in 2015 when both teams were building toward eventual World Series titles. He believes the Marlins can follow the same path, and this time he hopes to remain for the duration of the climb to the top. Manager Don Mattingly, who has also been vocal in endorsing Jeter’s plan, said it’s good to have a veteran like Straily on board with the approach. Straily, eligible for arbitration the first time, missed the first two days of spring training this week to argue his case in Arizona. He sought a raise from $552,100 to $3.55 million but lost his case Friday and was awarded the Marlins’ offer of $3,375,000. In his first season with Miami last year, Straily tied for the National League lead with 33 starts and had a 4.26 ERA. Straily and right-hander Jose Urena are the only established starters , meaning three rotation spots are open, and there will be a scramble for everyday jobs as well. But Straily said that doesn’t mean the Marlins will be awful, recalling his experience with a young, surprising Oakland team in 2013.